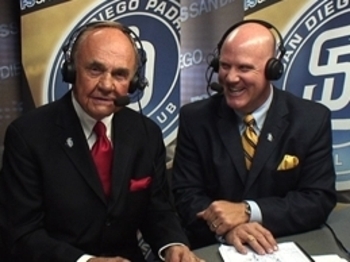 Thanks for your question, and your heartfelt concern for one of San Diego’s most beloved media characters. I was going to make a joke of his absence, as I do almost every year that this questions is asked, but will refrain since it always sends people into a panic before realizing that I am simply having some fun. Truth of the matter is Mark has simply been on his annual, mid-season planned vacation to spend some much needed time with is family. Mark takes this break every season, yet people always seem to think that something drastic has happened to him. In the past I have joked about his being suspended, incarcerated, traded, kidnapped, and one year he had given up his analyst job to join the Hare Krishnas. None of that, of course, has ever been true. He’ll be back on your TV screen tomorrow. Enjoy him…he’s a good egg! I Want to wish you a very Happy Birthday!!! !